In the early 1870’s the House of Assembly sat in a hall, hired from the Goede Hoop Lodge, at the top of Grave Street, now Parliament Street. The Legislative Council, on the other hand, sat in the Council chamber on the first floor of the Old Supreme Court Building (Slave Lodge) at the top of Adderley Street. The two Houses were nearly half km apart, a distance that did nothing to lessen their disagreements. It was obvious that such arrangements would not do for a properly constituted Parliament with responsible powers. There had to be a new building to accommodate both Houses and all the staff. Molteno’s Government appointed a Select Committee in 1873 to find the answers. Suggestions were, the Parade, Greenmarket Square, Caledon Square, an open space at the top of the Avenue and even the Paddock, opposite the present art gallery. It took the Select Committee more than a year to decide on its present location. It was decided to hold a competition in which a first prize of two hundred and fifty guineas was offered. The successful entry was submitted by a clerk in the Department of the Public Works, Charles Freeman. It shows a lofty entrance leading into a most impressive structure dominated by a great central dome that bears a distinct resemblance to that of St. Paul’s Cathedral, London. The most significant feature of Freeman’s design was his estimation of the cost, which he put at £50,000, the limit fixed for the competition.On The 12th of May 1875, His Excellency the Governor, Sir Henry Barkly, layed the cornerstone in the presence of a large and distinguished gathering. Building operations ran into immediate difficulties. The foundations had to be sunk to a far greater depth than had been specified, water had to be pumped from the site and it soon was apparent that the estimates bore no relation whatever to the true costs. A tremendous row ensued, all work was suspended and Freeman, accused of neglecting his work and misleading the Select Committee, was sacked from the post of resident architect and from the Public Works Department. At this stage the proposed Houses of Parliament were no more than a large hole in the ground and some foundations. Ultimately it was decided that a fresh start be made on the original site. Mr. Greaves of thePublic Works Department, who had been brought to Cape Town to supervise the building operations, was asked to prepare new plans. In 1879 the work was begun again but in re-laying the foundations, the cornerstone laid by Barkly was dumped with the rubble and no trace of it has ever been found. The Building contractors were Bull and Company of Southampton who were at the same time engaged on building the New Law Courts in The Strand, London. Their work did much to raise the standard of building generally in Cape Town. The original building was built mainly of materials brought from England, good Victorian Baroque components which have survived very well. Bays of red brick between giant pilasters, classically treated openings, balustrade, entablatures, cornices, Corinthian columns, excellent metalwork – all the outer casing of classical revivalism provides a dignity which is difficult to emulate in today’s idiom. Public Works Department, who had been brought to Cape Town to supervise the building operations, was asked to prepare new plans. In 1879 the work was begun again but in re-laying the foundations, the cornerstone laid by Barkly was dumped with the rubble and no trace of it has ever been found. Apart from the Mendelssohn collection, Parliament also owns and keeps up to date a modern reference library now containing over 100,000 books and several hundred publications including official journals and documents. It specializes in such subjects as history and biography, particularly political biography. There also is a wide selection of travel books, but novels generally are excluded although South African writers or novels that deal with this country make an exception in the case of fictional works. In terms of Act NO.22 of 1950, the Library of Parliament became a copyright library, which receives by right one copy free of charge of every book published in the country. It is available to members of Houses, the Judiciary and senior civil servants. 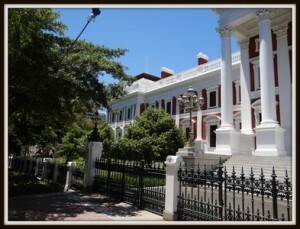 In the course of time, Parliament acquired many symbols of South Africa’s history, which now are housed in the Parliamentary museum that is open to visitors, as are the debates and proceedings themselves. Among these symbols are the Louis XIV table on which King Edward VII signed the South Africa Act, the original commission signed by the King giving the Royal Assent to the Act and the King’s gold pen and seal as well as the gold ink-stand used on the occasion. There also is a duplicate of the original proclamation declaring the 31St of May 1910, to be the date of the establishment of Union. Historica1 objects now on display in the Gallery Hall, formerly the Queen’s Hall, include a commemoration of the establishment of the Republic of South Africa.In 1987 a new wing of Parliament houses were added. This building is situated on Stalplein, next to Tuynhuys. It houses the National Assembly Chamber. The architect’s brief was to maintain the building’s classic Victorian style. They achieved this by retaining the Victorian elements in the façade, while creating a vibrant African interior. Indigenous wood was used as far as possible, especially yellowwood, which contrasts beautifully with darker woods like Afromosis, imported from Ghana and Cote d’Ivoire.